The federal government has come under heavy scrutiny after signing an investment treaty with China without public consultation or debate. Here are 5 things to know about the deal before it comes into effect which could happen as early as next week. 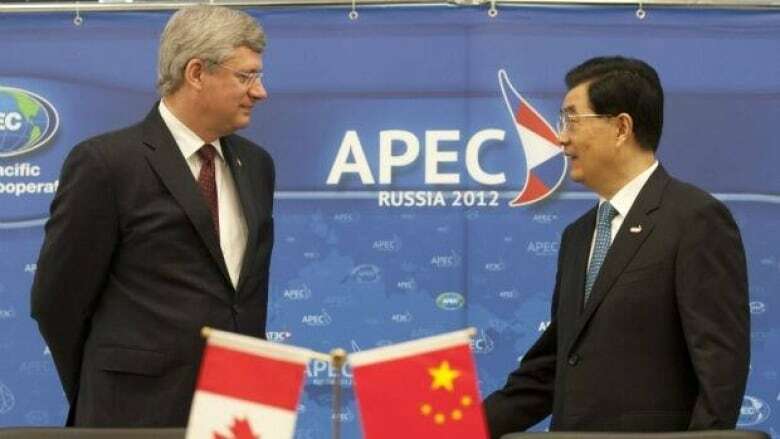 The federal government has come under heavy scrutiny from opposition parties and critics alike after Prime Minister Stephen Harper signed an investment treaty with China, formally known as a Foreign Investment Promotion and Protection Agreement (FIPA), while at the APEC Summit in Vladivostok, Russia, on Sept.9, 2012. While details of the agreement were kept secret until the deal was tabled in Parliament on Sept. 26., now that the details have been revealed, the deal itself does not have to be debated in Parliament. That's because treaty making is a royal prerogative and can become law through a cabinet order in council after sitting in Parliament for no less than 21 days after being tabled. Currently, Canada has 24 FIPAs in force with countries like Russia, Argentina and the Czech Republic. FIPA negotiations have been concluded with eight countries, including China, while ongoing negotiations continue with another 12 countries. A FIPA is not a free trade agreement but rather a bilateral agreement intended to "protect and promote" foreign investment through legally-binding rights and obligations. This FIPA is different from other FIPAs due to the sheer amount of investment China already has in Canada, said Gus Van Harten, an international investment law expert and associate professor at the Osgoode Hall Law School at York University, in an interview with CBC Radio's The House. Van Harten explained, the FIPAs Canada has in force are typically with countries who don't own major assets in Canada. However, under this treaty, Van Harten said Canadian taxpayers will assume "more of the risks and more of the constraints" than their Chinese counterparts to the degree that Chinese investments in Canada outpace Canadian investments the other way. According to Van Harten, the deal doesn't deliver on market access and investor protection. "We come out on the losing side on both," said Van Harten. "We should insist on reciprocity. The treaty does not allow for market access except under the exisiting legal framework of each country." The problem with that, Van Harten said, is Canada's legal framework is "more open and less opaque" than China's existing legal framework which will benefit China more than it will benefit Canada. Under this treaty, the investor-state mechanism is such that China could sue for decisions made by any level of government in Canada, if Chinese companies thought they were not being treated the same as Canadian ones. In other words, this deal could undermine the provinces "bargaining power," said Van Harten because "this very powerful arbitration process operates outside of the Canadian legal system and Canadian courts." Arbitration would happen behind closed doors, said Van Harten and if the arbitrators found Canada at fault, Canadian taxpayers could be left footing the bill. Several countries have already faced stiff punishment under such treaties. This, according to Van Harten, also calls into question whether the treaty is unconstitutional or not. The Opposition New Democrats, Liberals and Greens are all calling on the federal government to study and debate the agreement instead of ratifying it and locking it in for the next 31 years without public consultation – as they can do. In an interview with CBC Radio's The House on Saturday, NDP MP Don Davies, who serves as the international trade critic, told host Evan Solomon that if the federal government ratifies the agreement as it is now, it will have "frozen in time a very lopsided deal." Davies said they have "received 60,000 emails in the last two weeks from Canadians who are concerned about this deal." The federal government insists "this agreement includes reciprocal obligations" and is good for Canada, said the Conservative MP who tabled the FIPA with China. Also in an interview airing on CBC Radio's The House, Deepak Obhrai, the Parliamentary Secretary to the Minister of Foreign Affairs, said this FIPA with China "levels the playing field" between the two countries. Obhrai told Solomon, this agreement "give assurances to Canadian businesses that their investment in China is protected and they can do business in China because this is a deal that is open and treats our companies in each other's country on equal terms." The question we should all be asking ourselves Van Harten said, is "has Canada conceded something now that we were not prepared to concede under previous governments?" And according to Van Harten, the answer is "it's quite possible."